Thanks to the authors and editors: Jenny Diski, Nicola Barker, George Saunders, Ali Smith, Alan Furst, Edna O’Brien, Nate Silver, Lee Child, Robert Hare, Pauline Kael, Ngaio Marsh, Jack Fennell, and Jen Green; and to artist Nina Katchadourian. Previously featured: Diski in ‘Antarctica’; Barker in ‘Microworlds’ and ‘Inside Outer’ (and a post on reading coincidences); Smith in posts on compulsive pedantry and mutual unintelligibility; Furst in ‘After the Fire’ and a post on a significant hyphen; O’Brien in various places; and A Brilliant Void in a recent exploration of the Irish suffix –­een. 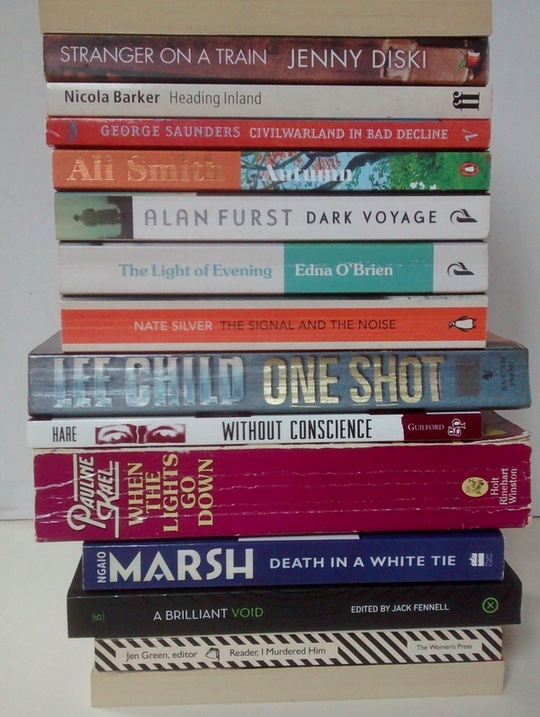 See the archive for more book spine poems, and join in if you like! This entry was posted on Wednesday, March 20th, 2019 at 7:11 pm and is filed under books, literature, poetry, wordplay. You can follow any responses to this entry through the RSS 2.0 feed. You can leave a response, or trackback from your own site.